This upscale suburb of Miami that is also known as Tree City, USA, has a most interesting past and an even more promising future. Back in 2009, those involved in the sale of Doral real estate couldn’t have been happier when Forbes Magazine ranked Doral City, Florida, second in an article entitled: America’s Top 25 Towns To Live Well. The city of Doral was incorporated along with Miami Gardens back in 2003, and its name derives from the owners of the famous golf resort located within its borders. Doris and Alfred Kaskel combined their first names to coin the city’s unique moniker. Thirteen miles west of downtown Miami and just one mile from Miami International Airport, approximately 46,000 people live in Doral and many of them own Doral real estate. In addition, more than 100,000 people work within the city limits in over 700 businesses representing 60 industries, most prominently those featuring aerospace and logistics. This volume of commuter activity along with a rapid population growth and increase in the sale of Doral real estate, have created significant challenges to the flow of traffic throughout the city. To ease the congestion for both Doral employees and residents, the Doral City Trolley was born in early 2008. 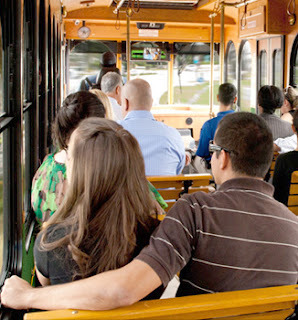 The trolley is free and operates within the city of Doral under the auspices of the Miami Dade County Transport between the hours of 7AM to 7PM, with numerous stops and the route is repeated every hour on the hour. Initially, there was one trolley servicing only one route. Today there are five trolleys that travel along three routes and on Friday evenings from 8 to 11 pm, the Doral Trolley offers a free Social Fridays in Doral service with stops near local hotels, cultural and entertainment venues. The Doral trolley is unique in that it lets riders see and track the actual status of the trolley, so they know when their ride is really coming. This eliminates annoying waiting time that could better be utilized seeing the sights, checking out Doral real estate or running other errands. Travelers dial a phone number, enter the STOP NUMBER located on the trolley stop sign and are informed of approximate arrival time. As if this isn’t cool enough, in 2011, this tracking feature became part of a mobile application that is now available at no charge to the public. The new Doral trolley-tracker displays a map of the city with the locations of all the trolleys and can calculate the expected arrival time to each stop. So come and experience the trolley and city of Doral, a premier place to live, work and play and its trolley. You might fall in love with it and want to move here. If you do, call us for a listing of available Doral real estate.